The Tatio Geyser field is the third largest in the world behind Yellowstone in the United States and the Kamchatka Valley of Geysers in Russia. 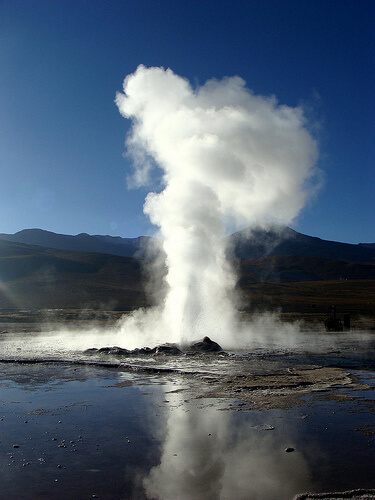 Most of the geysers at el Tatio erupt up to a height of about 75cm (2-3 feet) in the air. The larger geysers reach 20 meters (20 ft.). 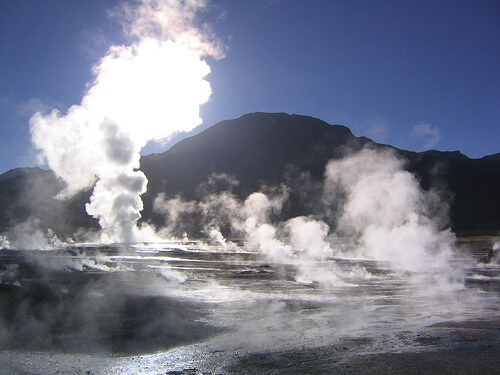 Even though these heights can’t rival those of other geysers around the world, el Tatio offers a very scenic setting. The geysers are situated near volcanoes, vibrantly colored pools of water, and native flora and fauna. You can go swimming in some of the thermal pools that have been filled with water from the geysers. However, the air temperatures can be below freezing in the early morning hours so dress appropriately. 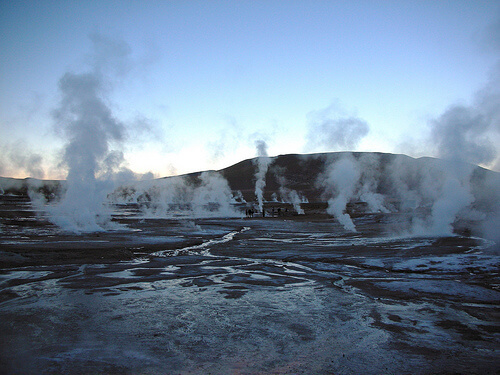 The el Tatio geysers are located near Calama. You can take a two-hour flight from Santiago north to Calama, or alternatively, there are buses that will make the same trip. 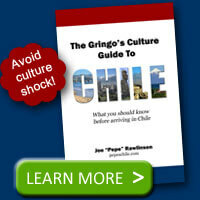 You can stay in Calama or nearby San Pedro de Atacama. From either of these locations, you can take tours that will drive you the roughly 145km (90 miles) to el Tatio. You can also rent a car and drive yourself, but you’ll want to request a car with high clearance since the road is rough. Most tours leave early in the morning (4 AM) so you arrive at El Tatio in time for sunrise. Pictures by silvia_mc, gerardo_chinchorro, and philliecasablanca. We love your updates! Keep them coming!!!!!!! 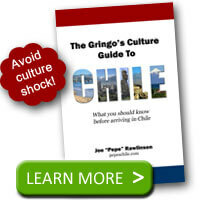 we’ll be in Santiago for five days after our return from Antarctica 12/20-12/26/10. thank you!